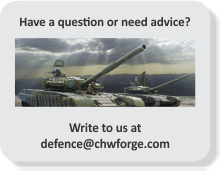 CHW Forge has the experience and capability to provide forgings to meet the needs and requirements of various defence organizations. We manufacture complex forgings for different applications which cater to Missiles, Battle Tanks (Upper and Lower Race Ring), Torpedos, Canisters, Missile launchers in Aluminium Alloys, Alloy Steel such as 15CDV6, 45XHM, Maraging Steel and so on. Our in-house research unit is working on the development of forgings with new materials to further improve the quality of products and meet varying requirements of the customers. Over the past few years, CHW Forge has been actively involved in large Government Projects and takes pride in associating with some of the India’s most prestigious and iconic projects. With the repeated excellence and proven capability, CHW Forge has been approved and registered with some leading organizations.